US President Barack Obama has vowed to pursue fresh UN sanctions against Iran despite Tehran's nuclear deal with Turkey and Brazil. Many Western countries have long suspected Iran is trying to make a nuclear weapon, but Tehran insists its programme is for purely peaceful, energy purposes. Mr Obama told Mr Erdogan there were still "fundamental concerns" about Iran's nuclear programme. The White House said Mr Obama had acknowledged the deal set out by Turkey and Brazil. But the US president "stressed the international community's continuing and fundamental concerns about Iran's overall nuclear programme, as well as Iran's failure to live up to its international obligations". The statement added: "Further, he indicated that negotiations on a new UN Security Council resolution will continue." It said Iran had persistently failed to meet the P5+1 countries - the five permanent UN Security Council members plus Germany - and had refused to halt uranium enrichment. Brazil and Turkey had both earlier expressed disappointment that proposals for new sanctions had been tabled a day after Tehran agreed to the deal. The new measures put before the UN foresee cargo ship inspections and new banking controls. "Brazil and Turkey are convinced that it is time to give a chance for negotiations and to avoid measures that are detrimental to a peaceful solution of this matter," the foreign ministers of Brazil and Turkey earlier said in a letter to the UN Security Council. On Monday, the three countries signed a deal in which Iran agreed to send low-enriched uranium to Turkey in return for enriched fuel for a research reactor. Placing Iran's nuclear material in a third country was intended to act as a confidence-building measure by the major world powers to prevent Iran producing more highly-enriched, weapons-grade material. A similar deal was suggested last year by the P5+1, who have been negotiating with Iran over its nuclear programme. But plans for a fourth set of UN sanctions against Iran over its nuclear programme were circulated among all 15 members of the Security Council on Tuesday. A close adviser to Iranian President Mahmoud Ahmadinejad, Mojtaba Hashemi Samareh, dismissed the new measures as illegitimate. 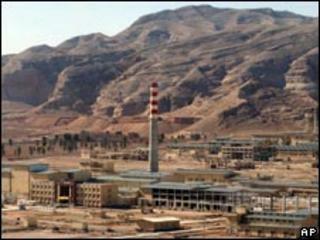 The head of Iran's atomic energy organisation, Ali Akbar Salehi, said the sanctions on Iran would backfire. "They won't prevail and by pursuing the passing of a new resolution they are discrediting themselves in public opinion," said Mr Salehi.